Picking the right modular trade show display system can be tricky. Will you be shipping the display? How many people will be there for set up and take down? Do you need to be able to change the graphics often? It goes without saying that you want to create the best possible trade show display for your brand. But figuring out which modular display system is going to be right for you requires more than just pretty pictures. 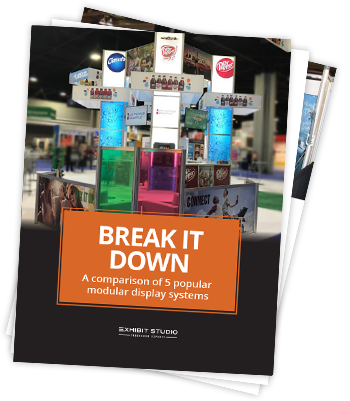 In this comparison of 5 popular modular trade show displays you’ll see what systems typically weigh for shipping, how many people it takes to put them together and a general budget so you have a better sense of which system will meet your overall requirements.